These are broccoli stalks like you've never seen them before. Pick up a bag of broccoli from your grocer’s freezer aisle and the picture on the package will promise you beautiful bright green broccoli tops. Open the bag, though, and you’re almost certainly setting yourself up for disappointment: It's never filled with solely florets, and all too often there is a disappointingly high ratio of stem to floret pieces. That disappointment stems (sorry) from the fact that we’ve all been misled: Somewhere along the line—perhaps thanks to perfectly arranged crudité platters—we’ve been taught that the flowery tops are the part of this brassica that we want to eat. 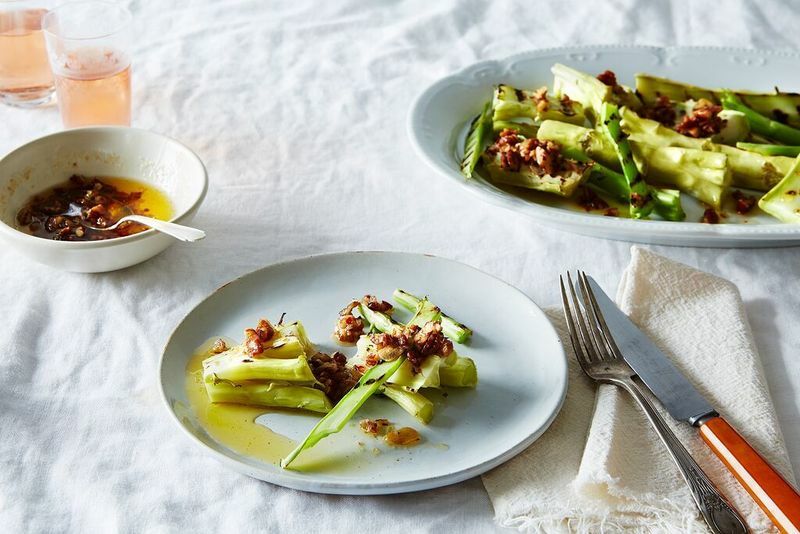 With this recipe for grilled broccoli stems topped with a slightly spicy, nutty butter, Food52er savorthis proves that the stems are just as valuable as the florets. Her inspiration came from the blog Ideas in Food. She was browsing the archives and stumbled across an article about using brussels sprouts stalks like bones—cooking them and scooping out the tender “marrow” in the center. She figured the same principle would apply to broccoli stalks, and she was right: Get ready to turn an underappreciated scrap into a dinner-party-worthy dish. 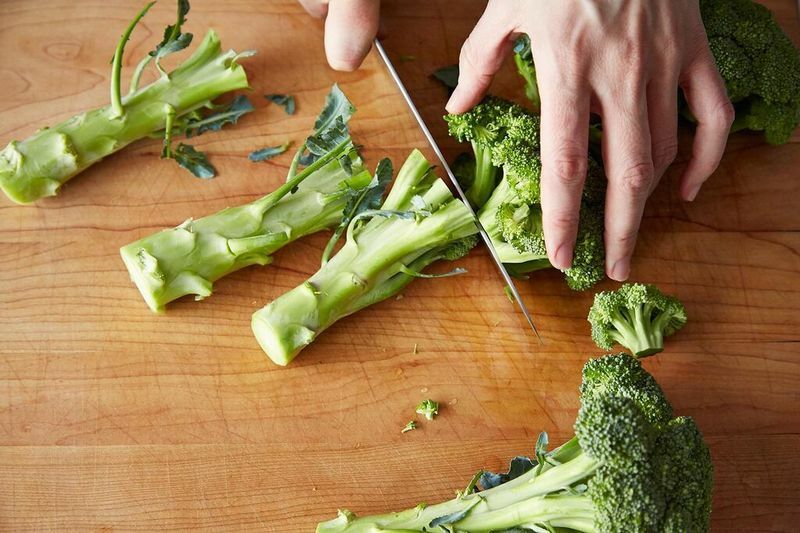 Although this method will work with any broccoli stems, it works best with later-season broccoli's longer, woody stems—they'll most closely approximate the sensation of scooping marrow from bones. And don’t bypass her suggestion to check for tenderness: Variations in broccoli stalk size will have a significant impact on cooking time. Know of a great recipe in the Food52 archives that uses an overlooked kitchen scrap (anything from commonly discarded produce parts to stale bread to bones and more)? Tell me about it in the comments: I want to know how you're turning what would otherwise be trash into a dish to treasure! Thank you for featuring my recipe! While we had a pretty sad growing season here thanks to massive hail storms early on, I do have a couple options for this recipe again: one broccoli plant that won't likely make florets in time but does have some nice stalks, and a massive kalettes plant which has just the tiny beginnings of baby florets (or whatever they might be called). I'm excited to see how that one tastes. Mom always used the whole Broccoli to saute down in butter and adds to cornmeal to make Broccoli Cornbread, the stalks add the moistness and sweetness it's a Family fav! this article opens up so many possibilities with broccoli stems, thanks Lindsay! My Grandmother used to make a relish out of the 'marrow' from Cauliflowers, (broccoli was unheard of in India then) dice the center, add salt, chili powder, a pinch of turmeric & asafetida and a a bit of fresh crushed mustard seeds. Heat some oil to smoking and pour over the mix. add the juice of a lime and serve up fresh as a relish. Oh I'm so happy you commented. I'd made a note about your use of squash guts (probably mentioned on the Hotline at some point) and had been meaning to contact you about it. Yes, please share the recipe!! Love this idea. We always thinly slice our broccoli stems and throw them into stir fries- I can't imagine ever throwing out such deliciousness! When I was in college, I lived for a couple of years in a house mostly made up of immigrants and children of immigrants from Guangdong (we called it Canton then). We did a lot of Chinese cooking; they used the broccoli stems and often tossed the florets. I don't understand buying a bag of broccoli. If at a farmers market, as in any of my local grocery stores, I can pick and chose among whole heads and stems and fill a bag of my own. I'm very happy to have the stems. Shaved, as Sam suggests, steamed, and pureed along with an inch or two of horseradish root, some cream and butter, and they're a most amazing foundation for any kind of braised meats. Sort of like polenta or potatoes without the carbs. Thanks, Lindsay, I've been thinking of writing it up, and I suppose there's no time like the present. You can add nuts or dried fruit as you wish. And any radish will do. Thanks for sharing, I look forward to trying it! Yes. Both these recipes have been in the rotation in our house for years. It would be great to feature longtime recipes, not just the recipes that have been captured in photos by food52 staff photographers. Such a waste of talent on the part of crowd sourced recipes. Bevi, I'd just like to point out that at 3 years old, this recipe from savorthis is in fact a longtime one -- once it's selected, then it is photographed. My goal for this column is to only feature recipes from this site, so please please, everyone, tell me about all of the great recipes lurking in the archives that use any type of overlooked kitchen scraps. I peel off the outer layer slice them into 'coins' steam them just a bit and drizzle them with sesame oil and a few red pepper flakes. You can also peel them slice into coins and put in the fridge with white vinegar to make a pickle. Yes! I've been giving them the sesame oil and red pepper flakes treatment thanks to you (must have been from you sharing on a Hotline thread at some point). I love the recent 'root to stem' movement in food - very keen to try this out! I might have imagined using the stem in a stock or something, but cooking it to approximate a marrow texture? I'm very intrigued!